Less than one percent of men will be diagnosed with breast cancer. The mortality rate however is quite high as awareness among men is less and they are less likely to assume a lump is breast cancer. This obviously delays treatment. 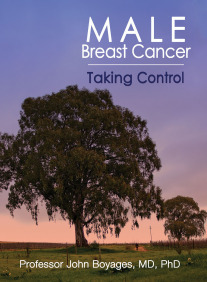 Male breast cancer exhibits the same symptoms as breast cancer in women, including a lump. When I developed breast cancer 13 years ago doctors with any experience dealing with men with this disease were few and far between. Luckily for me my local GP was on the ball as far as getting tests done when the lump was detected. There was absolutely no literature for men available. "It's the same as woman's BC, read that" was the general advice. In fact some people treated the diagnoses as a bit of a joke or thought I was pulling their leg about having 'a woman's disease'. I found a surgeon who specialized in BC and had treated men. After reviewing my case he performed a mastectomy. I still see him every year to read my annual mammogram and ultrasound. But again, in the hospital, the support staff including counselors and therapists didn't quite know how to handle me and my case. Granted I don't think breast removal for men is as emotional as it is for women but cancer is cancer. It was sort of a 'lonely' time. My experience encouraged me (and I believe a few other men) to lobby the various breast cancer organizations in Australia to remedy the lack of information. They were very receptive. Eventually most included a men's BC chapter in their literature. Now there is a book out covering all aspects of men's BC. Published in March this year, it is well worth reading. And the associated web site is here. My surgeon also recommended seeing a genetics counselor for a consultation. If a man tests positive for a defective gene (most commonly either BRCA1 or BRCA2) it can lead to a future diagnosis of breast cancer and his children having a 50% chance of carrying the gene. A female child of a man with breast cancer who inherits the defective gene has a risk between 40% and 80% of eventually developing breast cancer. This was of course a concern for my daughter. So I had the tests done and thankfully the results were negative. Men with a genetic predisposition to breast cancer are also at higher risk of getting prostate cancer at a younger age than usually diagnosed. Unfortunately this proved true in my case. But again my local GP was on the ball with PSA testing and we caught it early. Nearly four years on and my PSA tests always come back as 'undetectable'. The point of this post is that men should not ignore breast lumps and occasionally do self testing. The shower is a good place. And PSA tests from around 40 years of age goes without saying. It may save your life. Retired life on a small farm and hobby vineyard on the south coast of New South Wales, Australia, is never dull. Share some of our day to day experiences at home as well as on trips away both in Australia and around the world. The Man That Never Was.